Receiving the Shore is a collaboration bringing together poetry by Jennifer Burd and musical settings of those pieces by Laszlo Slomovits. The ten longer poems in the book are interspersed with meditative haiku sequences and evocative drawings by artist Melanie Boyle. 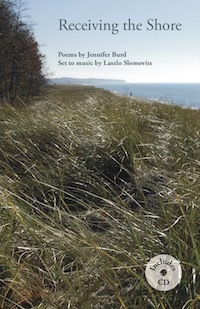 The accompanying CD includes song settings for all the poems, sung and accented with folk flutes by Laszlo. Musical arrangements for all the pieces are by Emmy award-winning pianist Brian Brill. We are invited to enter these inner and outer spaces, and move through the seasons in both word and song.